While cryptocurrencies are in a brand new asset class, they have much in common with precious metals, the most historically interesting commodity group. To see what we might learn about the future by examining the past, read on. 1) There is more than one. First, you may have heard about Bitcoin, and some of the other popular alternative currencies such as Ethereum, Litecoin, and Ripple, but there are thousands more, most of which are essentially worthless. Similarly, the top dog in the precious metals world is gold, but others such as silver, platinum, and even palladium maintain an active user base. Further down the chain is a heap of other metals that never gained a following. 2) They have varying degrees of scarcity. With precious metals, the typical denomination is the ounce, but when looking at the scarcity of an element, we need to take into account the total number of ounces that have been pulled from the ground. All of the precious metals vary in their overall quantity. One ounce of gold is quite different than one ounce of platinum, which we’ll explore in a moment. With cryptocurrencies, the typical denomination is, well, the number 1. It can be a little confusing, since there isn’t anything tangible to hold in our hands and count, but similar to precious metals, we can look at the total number of units available, and determine what proportion of the overall pie a single unit represents. For instance, there are about 17 million bitcoins in the world today, so 170,000 bitcoins should be thought of as 1% of the total. Getting back to gold and platinum, looking at their market prices for 1 ounce, you may draw the wrong conclusions about their abundance. Gold has been trading at around $1,200 and platinum at $950. 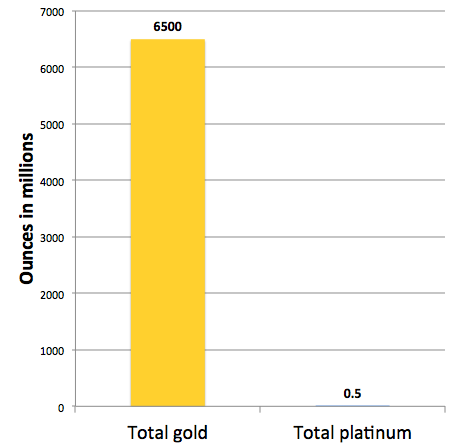 Yet in reality, platinum is 4 orders of magnitude scarcer than gold! That’s right, there is 10,000 times more gold (6.5 billion ounces) available than platinum (500,000 ounces). All of the platinum ever mined throughout history could fit in a cubic box 25 feet on each side. To own 1% of the world’s gold, you would need to purchase 65,000,000 ounces which would set you back about $78 billion. To own 1% of the world’s platinum, you would need to purchase 5,000 ounces, which would only cost you $4.8 million. 3) They have unique properties. The market price for precious metals is similar to cryptocurrencies in that certain properties make them better or worse suited for different applications. Gold is highly resistant to corrosion, making it great for storing long term, or in an industrial manner as a conductive end piece in electrical connections. It’s not the best conductor (copper is), but it serves that specific purpose the best. All precious metals share properties to some degree that make them great money such as durability, fungibility, difficulty to fake, etc. Likewise, cryptocurrencies carve out different niches in the ecosystem. Bitcoin serves well as a trusted, secure, and censorship resistant accounting system. Ethereum serves well as a flexible and decentralized application platform. They each have a market price based on the demand for their uses, both monetary and industrial. 4) Most people don’t have any. If you were to divide the gold and silver evenly throughout the world, each citizen would receive about 1 ounce of gold and 10 ounces of silver. That’s a surprisingly low bar to enter the more-than-average-amount-of-precious-metals club. The reality is that most people don’t own any, despite knowing about them. Estimates vary depending on the country, but a conservative figure is that less than 5% of the global population has any gold or silver to their name. With cryptocurrencies the percentage is even lower, and not surprisingly considering how new they are to the world. In many ways, their overall penetration in the market should be expected to be higher than that of precious metals. After all, to acquire and store cryptocurrencies all you need is a smart phone, and more than 4 billion people use those. The basic lessons is that both precious metals and cryptocurrencies share a rich market-based ecosystem, where trade-offs in certain properties define their use and value. Furthermore, cryptocurrencies can still be successful even with modest global adoption, but considering their disruptive and exponential growth over the past 8 years, we can reasonably expect them surpass precious metals in overall adoption.